I hear you cynics out there: You took a vacation, and you live in Rome? Yes friends, we had to get away and see more of this amazing country. Plus we needed to cool off! First stop, Verona. You know, Shakespeare: Romeo and Juliet, and Two Gentlemen of Verona. While we made the obligatory stop at “Juliet’s Balcony,” the motivation was to experience this town we’ve heard much about, and to attend an opera in the Arena, a 2000 year old structure much like Rome’s famous Colosseo. It was quite a production. “Aida” is a huge and fascinating work. Staged in the ancient Arena in Verona, the stage was elaborate and took full advantage of the venue. 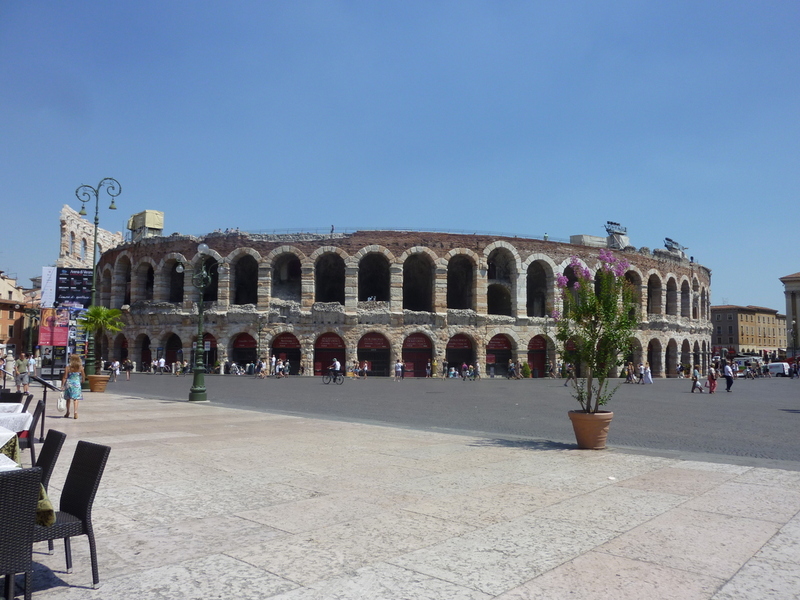 The Arena in Verona used to be twice as tall. Amazing to be able to attend an opera in a 2000-year-old structure! 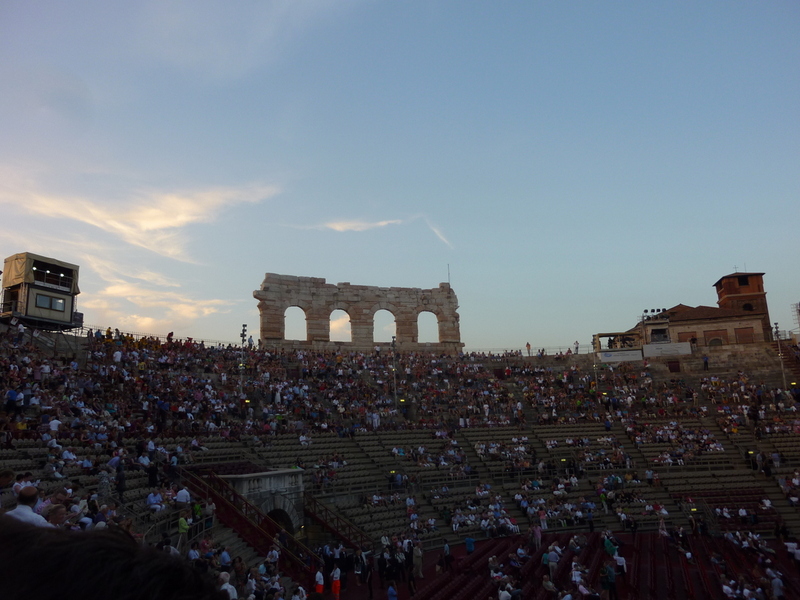 The Arena begins to fill with opera-goers as the sun fades away and night descends. Verona is a very nice little city settled by the Romans in the crook of a river, the Adige. Anchored by beautiful Piazza Bra (nothing to do with women’s lingerie), Verona requires nothing more of one than to stroll, savoring the architecture, the ambience, the food. 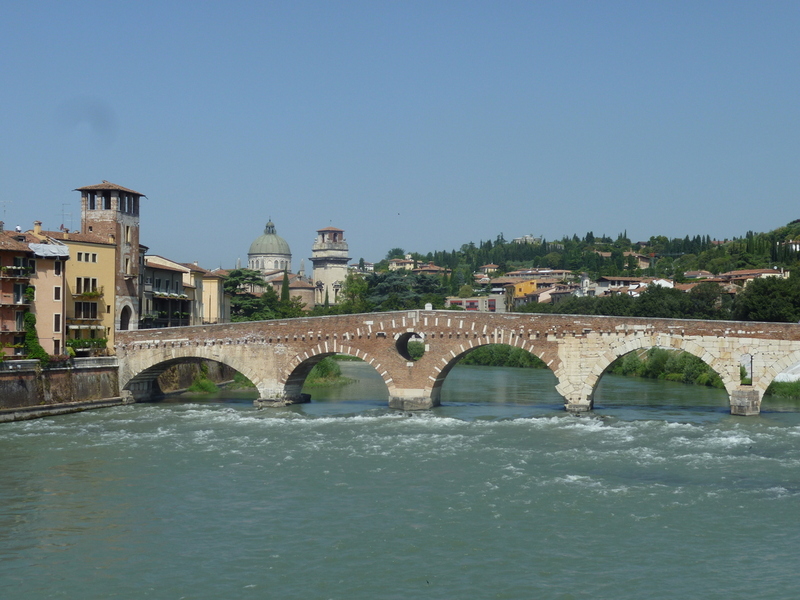 Not quite like the Willamette River, the Adige runs fast through Verona, but there are a lot of bridges, green hillsides, and charming architecture. Many bicycles, too. More than we’ve seen since Amsterdam. Were you ever a journalist? You are quite good at this! I feel like I’m there with your descriptions! We miss you and Ric but are so happy for you. Friday is family day so I’ll finally see the office ( thought of you). I do hope you and Ric continue taking many “vacations”. Your descriptions are priceless. I saw Aida on Broadway in NYC. 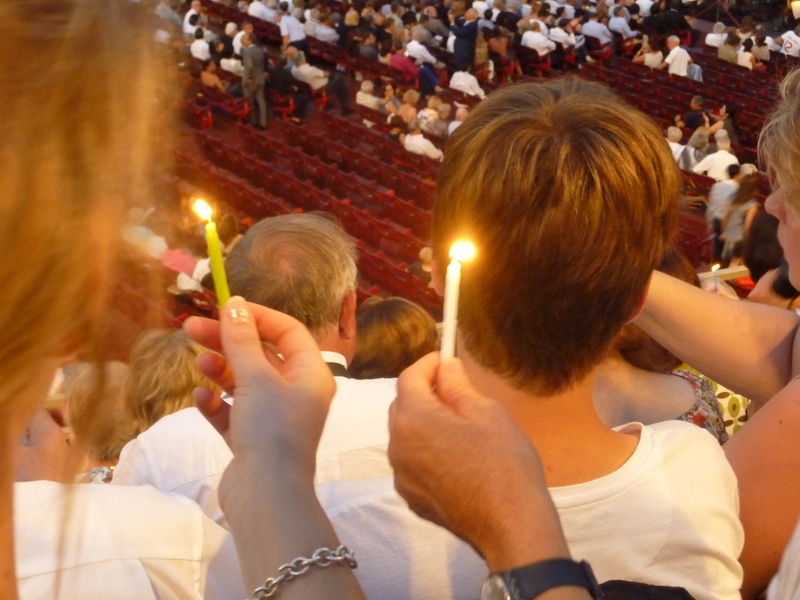 I’m sure seeing the opera in the Arena venue would take my breath away. Portland summer continues to be quite mild. Fine with me. We did Aida at the Met in NYC. 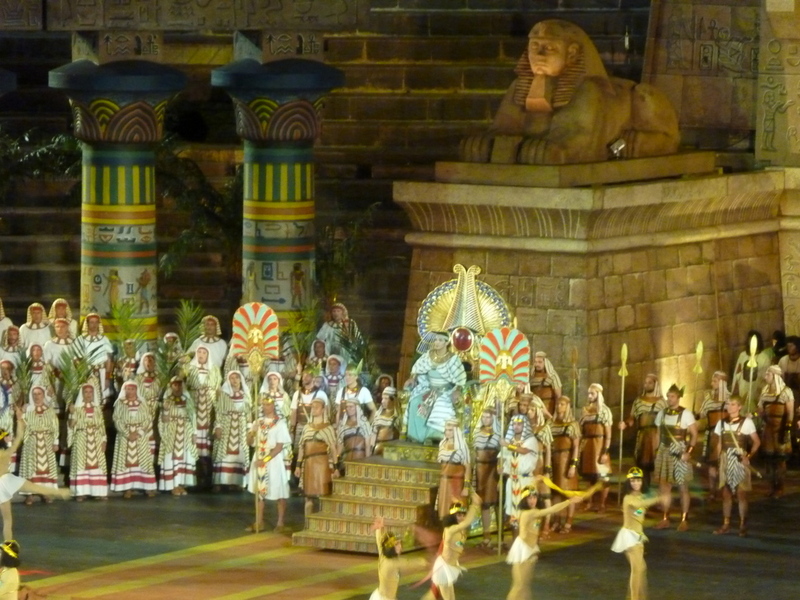 The staging was amazing…even had camels! But by the end I really wanted someone to shut her up. I figured if they didn’t close up the wall soon I’d have to help her leave this world! I love, love, love your posts! Keep it up! And before you leave, we just might join you for dinner in Rome. We seem to gravitate to Italy every two to three years. It would be fun to have you show us the REAL Rome! Oh God, it was that last act that about killed me! But the soprano, wow! How can they sing so long?!?!?! Do come over. If not Rome, we’ll meet you elsewhere in Italy for a getaway! Wait for my next installment on Ortisei! You have to come over and see us!